For the Leeks & Goat’s cheese Tart, I was largely inspired by this recipe on Gourmet Traveller, except I didn’t puree the leeks here. The Duck Confit legs were just ready to be heated up and I caramelized them in a bit of Duck fat, skin side down, to give it a bit of a crisp. As there was enough fat coming with the Confit, I decided to use it to fry potatoes, unpeeled and thinly sliced, until nicely golden and crisp. 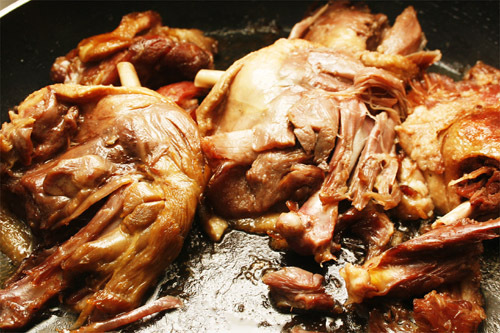 Together with the duck legs, these were a major hit at the table, we couldn’t hear much talking for a few minutes! For my vegetarian guests, I had prepared a Gratin Dauphinois, a specialty from my region, which is more or less a creamy potato bake. 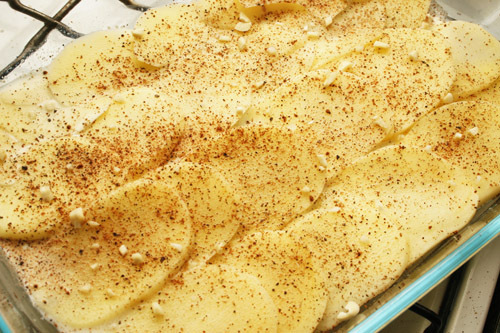 For this, I have sliced Desiree potatoes very thinly, and placed them nicely on the baking dish, alternating between milk and cream to pour in between each layer of potatoes, as well as sprinkling generous amounts of chopped garlic and ground nutmeg. Be careful to leave yourself enough time to prepare this dish, as this baby takes at least an hour to an hour and a half to cook in the oven. 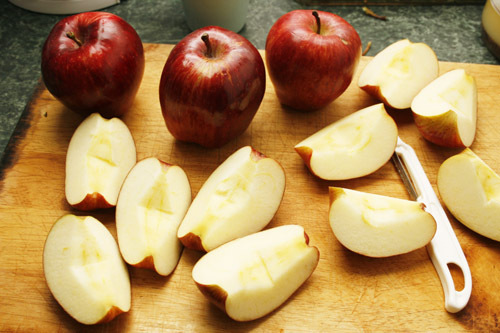 I peel some apples, cut them into quarters, remove the core and pour some lemon juice over them, as well as some caster sugar. In the meantime I start on the scary caramel, being very careful to not let it burn. 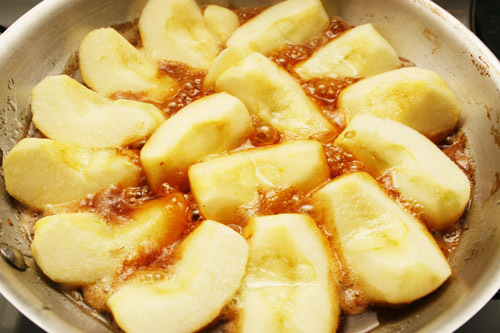 When the caramel starts to turn brown, I place the apples quarters nicely in the pan, with some dices of unsalted butter. I let them cook for a few minutes for the apples to start cooking and soften. 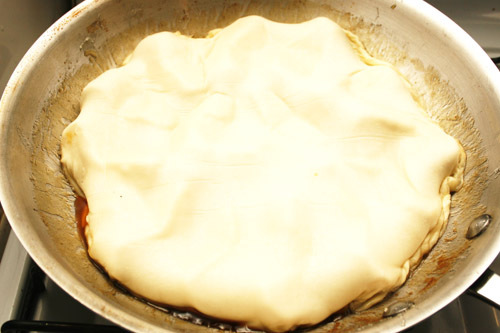 After letting the apples cool down for a few minutes, I place the sheet of Puff pastry on top of the pan, tuck in the edges under the apples and put in the oven for about 30 minutes. Once the pastry is golden brown, remove carefully the pan from the oven (“carefully” because of course I burnt myself , even though I knew the handle would have to be pretty hot at that stage! Tss tss…). Tadaaa!!! I am pretty pleased with myself, considering I never cook desserts… pretty happy! Serve with a good quality Vanilla ice-cream or simply cream. To finish on an even nicer note, I was chosen as this week’s Featured Foodie on SBS Food website!!! You can check out the interview on: http://www.sbs.com.au/food/article/4242/Featured_Foodie_Sandra_Beeston. 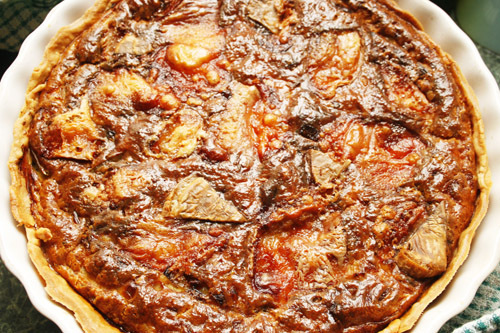 This entry was posted in Events, Recipes and tagged Bastille Day, Duck Confit, Duck Fat, Gratin Dauphinois, Potatoes, Recipe, SBS Food, Tarte Tatin. Bookmark the permalink. Hi! I just moved to Sydney recently and have just discovered your blog. I love French food and the dishes you make look delicious. 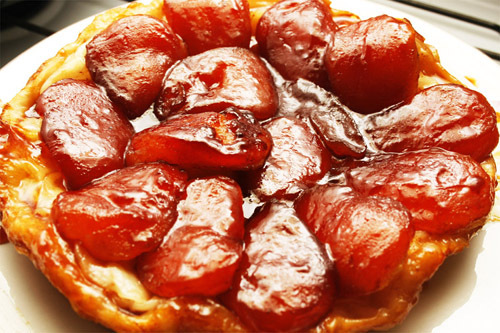 I can’t wait to try that Tarte Tatin. I never thought you would be so interested in food and so good at cooking, it musyt be in the genes ! I’m very pleased about it ! 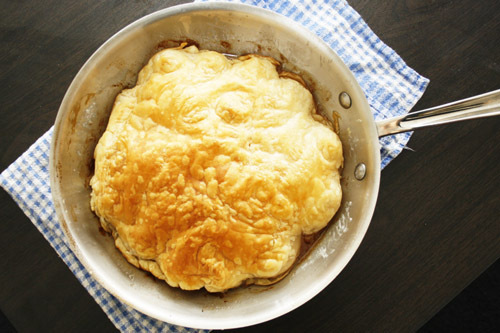 That tarte Tatin looks delicious ! What’s next ? Oeufs à la neige ? My Dad’s birthday is Bastille Day too, that is such a coincidence. 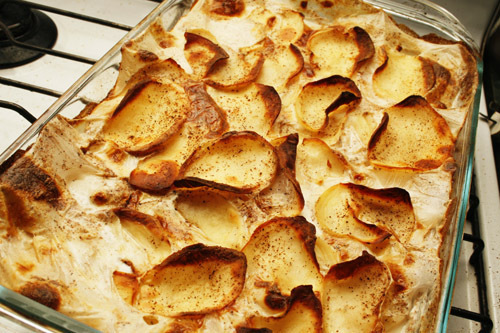 Your gratin dauphinois look so delicious as well as your tarte tatin. What a wonderful meal all up, yum. Oh, how delicious! 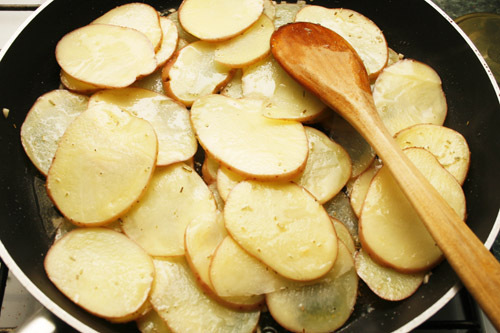 Whenever I’ve done duck fat potatoes I’ve cut them into chunks – they’re divine, but slices gives a much greater surface area for the duck fat. I’ll definitely be trying that next time. 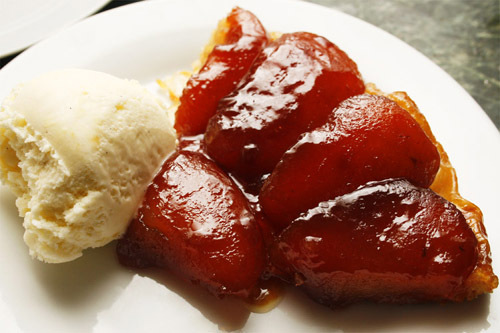 Oh, and the tarte tatin looks amazing. that is one good looking Tarte Tatin! So puffy and golden brown. Nice work…. That is how I found your blog and am now following. I am a French Canadian and am loving your take on Classics. I live in brizzy and its wonderful to see french cooking down under! Had Tarte Tatin as part of a delicious and relaxed family lunch yesterday – at least it was relaxed for me as I didn’t have to cook or clean up. Congratulations on your very interesting interview on SBS. The love of good, fresh ingredients is obviously in the genes. As a follow up to your to your Soupe au Pistou recipe earlier this month, below is a simple and delicious winter warmer. Heat ghee or butter in a saucepan and gently fry onion until golden. Add garlic and ginger and cook for 2 minutes. Add lentils, water, crushed tomatoes and bacon bones. Bring to the boil and simmer for 15 to 20 minutes. Leave bones in over night. Skim off any fat and remove any meat from the bones. Reheat and serve with croutons. Serves 6. You can add a small potato and carrot (both diced) to start with and some frozen peas towards the end to make more of a meal of it. What a fabulous dinner and a grand way to celebrate! 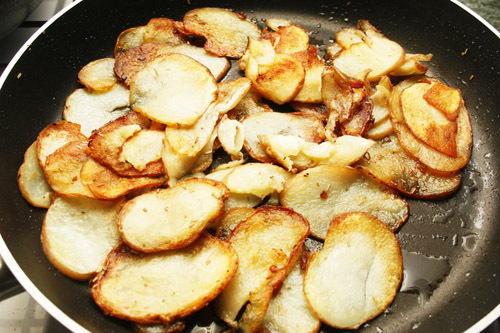 I usually bake the potatoes in (guilt-free) duck fat but I might try frying them next time.